Some actions by the President of the United States can have far-reaching international consequences, including something so trivial as how he reacts to a particular global warming alarmist book. … Clinton used much of the time for that great solitary pursuit, reading. He delved into Snow in August by Pete Hamill and The Heat Is On by Ross Gelbspan, while Hillary read best seller The Perfect Storm by Sebastian Junger. Clinton’s reading list at Martha’s Vineyard. Hillary is reading “The Perfect Storm” by Sebastian Junger. While it may be open to debate, a hard-to-avoid appearance is seemingly projected from these rather casual mentions of ordinary novels and one other seemingly spy novel-like title needing the additional tag ‘by environmental journalist Ross Gelbspan.’ “Who cares what novels the President is reading? Oh, wait, that non-fiction ‘The Heat is On’ does sound like something really important.” Could it be that the mention of ‘unspecified trashy beach novels‘ takes this questionable appearance one step too far? 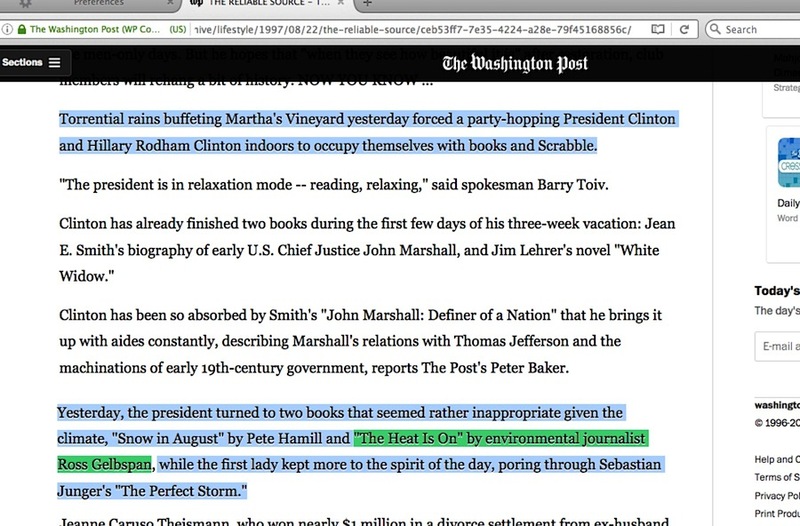 When Mr. Clinton vacationed at Martha’s Vineyard in August, he was pictured holding the book, “The Heat Is On,” investigative reporter Ross Gelbspan’s attack on industry claims against global warming. 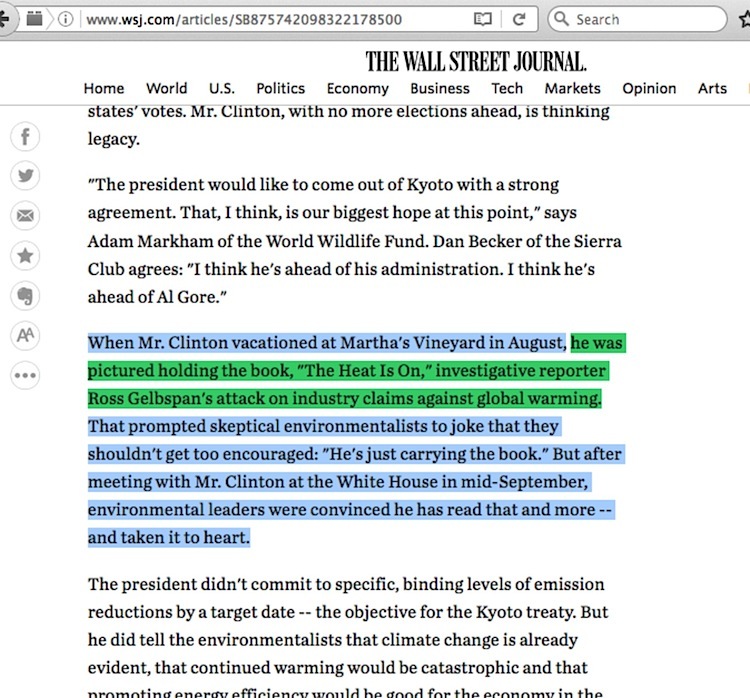 That prompted skeptical environmentalists to joke that they shouldn’t get too encouraged: “He’s just carrying the book.” But after meeting with Mr. Clinton at the White House in mid-September, environmental leaders were convinced he has read that and more — and taken it to heart. I believe we are about to experience a national, possibly worldwide, debate on the constraint of fossil fuel use. ….. I wonder if either the author or his readers would be shocked to learn there was a mile of ice covering Chicago 20,000 years ago? Maybe carbon dioxide is increasing because of human activity and maybe that can lead to long-term climate change, but we’d better base policy decisions on scientific investigation and demand informed debate on the part of our political leaders. Oh, him. Yeah. I invited the skeptic scientists he spoke of and others to the White House, what they told me sure puts a big dent in what the Intergovernmental Panel on Climate Change says, it’s really detailed material, y’all should look into it. But I also had my staff check that guy out. His book says he is a Pulitzer winner, but the Pulitzer organization says he absolutely is not. What he said about skeptic scientists taking money from the coal industry won’t hold up as proof of corruption in a courtroom if he doesn’t have the evidence that what they say was paid for and concocted out of coal company conference rooms. Even I as a dumb ol’ Arkansas lawyer knows that. 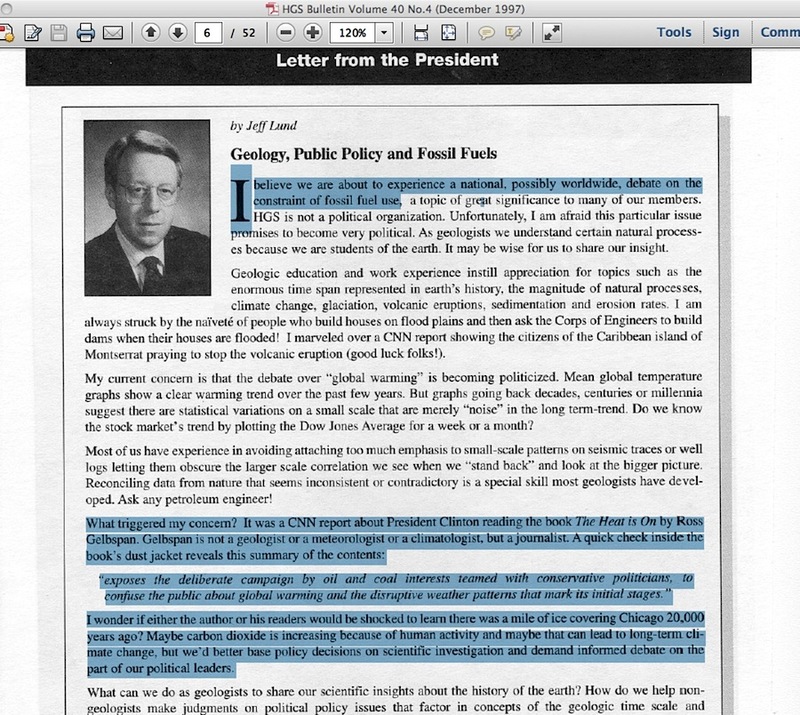 Hell, one of the scientists said he no connection whatsoever to that “reposition global warming as theory rather than fact” deal Gelbspan writes about, and if Gelbspan knew that, he could be looking at a serious libel lawsuit from that scientist. Might be one huge story for y’all right there. That’s a fiction account of what President Clinton could have said. But the bits about the Pulitzer problem, the ‘no connection’ scientist problem, and the ‘lack of corruption’ problem are all as real as can be, and serious science-based rebuttal from PhD-level scientists criticizing material from the IPCC could be found when reporters at major newspapers back in 1997 made the effort to find them, just as easily as it can be found today. 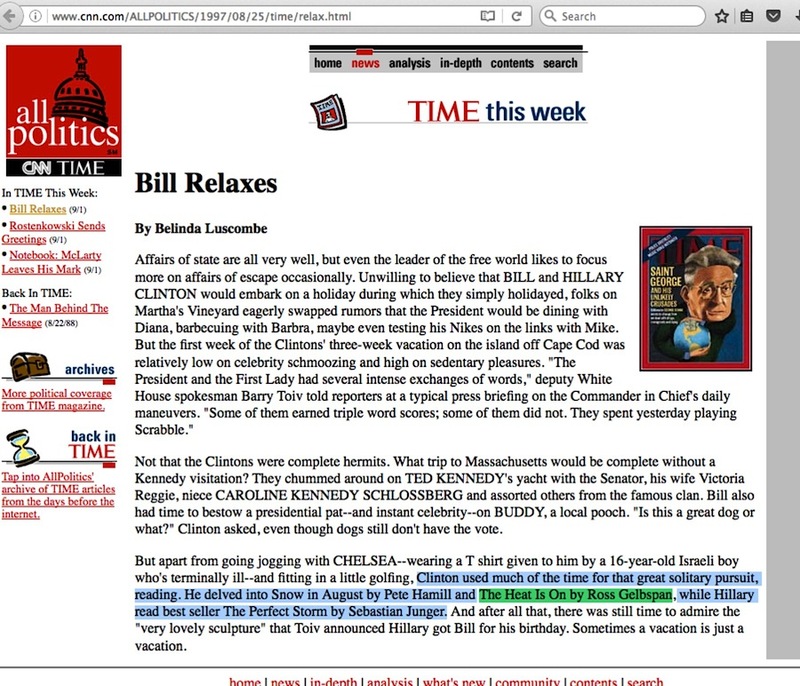 The situation about President Clinton’s old reading list isn’t an irrelevant bit of old trivia, it is a window into the world of the collective efforts – then and now – to use character assassination as a means of preventing the global warming issue from collapsing under the crushing weight of policy decisions being based on full scientific investigation and informed debate. This entry was posted in mainstream media reporting by Russell Cook. Bookmark the permalink.